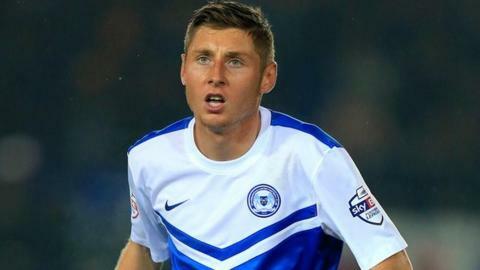 Harry Beautyman scored his first goal for Peterborough United to send Yeovil back to the bottom of League One. The 22-year-old midfielder, who signed from non-league Welling in November, got the last touch to Marcus Maddison's shot to put Posh ahead. The Glovers were unbeaten in their previous three games, but failed to convert chances in the second half. Kyle Vassell could have doubled the home side's lead, but put the ball over from two yards out. Crawley's surprising 2-1 win against Preston meant Yeovil slipped down to 24th, four points from safety. Posh, meanwhile, moved up to 11th, only two points outside the play-off places. "It was a difficult game given the conditions and it was difficult to expect either team to play Barcelona-type football, even if they could. "Both teams realised it was a long-ball game today. "The first bit of quality they had going forward, they scored their goal. "In the second half we gave it a bit of a go without really making their goalkeeper work." Match ends, Peterborough United 1, Yeovil Town 0. Second Half ends, Peterborough United 1, Yeovil Town 0. Attempt blocked. Liam Shephard (Yeovil Town) right footed shot from outside the box is blocked. Substitution, Peterborough United. Kgosi Ntlhe replaces Marcus Maddison. Attempt saved. Aaron McLean (Peterborough United) right footed shot from outside the box is saved in the top centre of the goal. Substitution, Yeovil Town. Nathan Ralph replaces Kieffer Moore because of an injury. Hand ball by Seth Nana Ofori-Twumasi (Yeovil Town). Substitution, Peterborough United. Aaron McLean replaces Conor Washington. Substitution, Yeovil Town. Sam Hoskins replaces Alex Smith. Corner, Peterborough United. Conceded by Liam Shephard. Jermaine Anderson (Peterborough United) wins a free kick in the attacking half. Substitution, Peterborough United. Luke James replaces Kyle Vassell. Attempt missed. Kyle Vassell (Peterborough United) right footed shot from the centre of the box is too high. Attempt blocked. Alex Smith (Yeovil Town) left footed shot from outside the box is blocked. Corner, Yeovil Town. Conceded by Christian Burgess. Attempt blocked. Seth Nana Ofori-Twumasi (Yeovil Town) left footed shot from outside the box is blocked. Attempt missed. Liam Shephard (Yeovil Town) right footed shot from outside the box misses to the left. Attempt missed. Nathan Smith (Yeovil Town) left footed shot from a difficult angle on the left is close, but misses to the left. Attempt blocked. Conor Washington (Peterborough United) right footed shot from the left side of the six yard box is blocked. Substitution, Yeovil Town. A-Jay Leitch-Smith replaces Jamar Loza. Second Half begins Peterborough United 1, Yeovil Town 0. First Half ends, Peterborough United 1, Yeovil Town 0. Harry Beautyman (Peterborough United) wins a free kick in the defensive half.